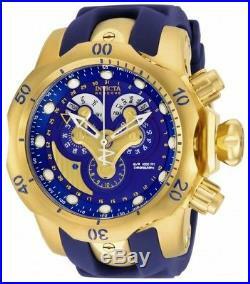 Invicta 14465 Men's Venom Chronograph Blue Dial Dive Watch. Invicta 14465 Venom Reserve chronograph men's dive watch features a 54mm wide gold plated solid stainless steel case with a unidirectional rotating bezel and textured screw down crown with function pushers. Invicta 14465 is powered by a precise Swiss 5040. This stylish watch also features a textured blue dial with white accents gold tone luminous skeleton hands and dot hour markers along with the chronograph, day-date and month display functions, scratch resistant flame fusion crystal and water resistant to 1000 meters. 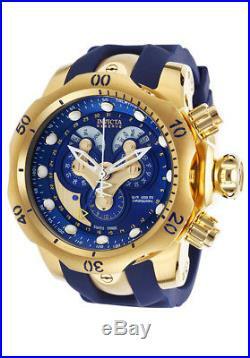 Invicta 14465 is equipped with a 26mm wide gold plated solid stainless steel and blue rubber strap with a buckle clasp. We are authorized dealer for many of the brands we carry. We offer a large selection of fine wristwatches, shoes, sunglasses, jewelry, and other gift items at significant savings. Please allow 1 to 2 days for processing. However, it is not a guaranteed that you will receive your order on this date. International customers please note the following points. Item must be declared as merchandise and not as gift. Please only submit order if you agree with the above points. We recommend sending your return via a traceable service. Note: Personal care items such as fragrances are not returnable once opened. Zippo lighters are also not returnable once the seal on the back of the lighter is broken. The item "Invicta 14465 Men's Venom Chronograph Blue Dial Dive Watch" is in sale since Friday, May 18, 2018. This item is in the category "Jewelry & Watches\Watches, Parts & Accessories\Wristwatches". The seller is "mygiftstop" and is located in Shelton, Connecticut.